Click on photo to enlarge Equestrian Traveller Mary Pagnamenta has answered New Zealand's call to adventure! 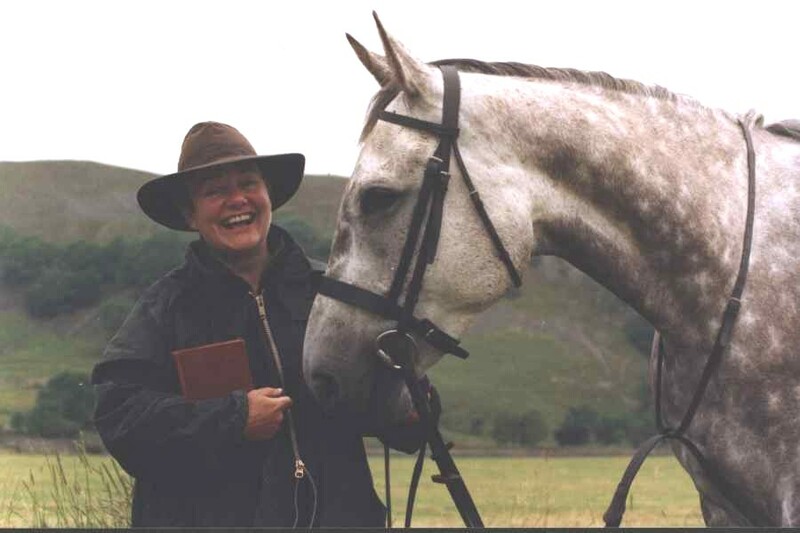 Solo Equestrian Traveller, Mary Pagnamenta, is following in the hoof-prints of her fellow Members of The Long Riders' Guild, Robin and Louella Hanbury-Tenison. 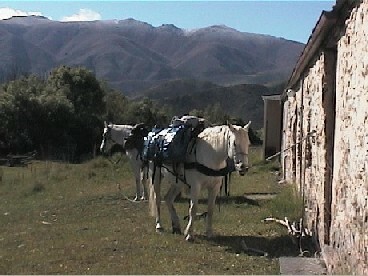 The young Englishwoman has purchased two local horses, Boris and Foggy and is now ready to depart. Mary emailed The Long Riders' Guild to say, "My horses are a redoubtable pair - both strong characters for whom their nutritional welfare comes first, second and third as priorities in their lives. They know all about picnics, sandwiches, chocolate wrappers and muesli bars. Boris had his teeth rasped last week - his sole reason for concern about the indignity of the gag was that he was still unable to eat whilst the vet changed the rasp! He works on the principle that it is no use wasting valuable eating time getting stressed about things - a mouthful of grass is a great soother to a troubled mind!" 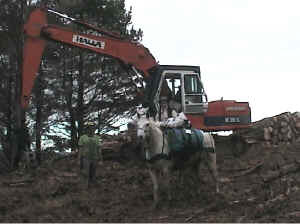 Accompanied by her horses, Mary has no plans to use a back-up vehicle. She aims to travel off road, where she can be as self-sufficient as possible. She is working with the Riding for the Disabled Association in New Zealand and will be joined for short stretches by riders with disabilities, for whom the four strong legs of a horse provide a freedom of movement that they might never otherwise know. Mary has just emailed The Long Riders' Guild with an update on her progress. "We have been in Christchurch for five days, having a little R&R. The last few weeks have been just full of bright sky and torrential rain, clear still days and gales at a hundred miles an hour, hot dry plods along the lakeside and cold sharp nights beneath a frozen sky at 1600m, the occasional lap of luxury as a guest in people's houses, and pretty squalid dossing in very basis shearers' quarters. A bit like ice cream and chocolate sauce really - big contrast, all delicious." "Ecstatic over my first views over the Southern Alps, we picked our way down the track from Omarama saddle on a high - and came face to face with 1200 kilos of black reality. Enjoying his siesta on the track ahead was an extremely large, muscular and mean-looking Angus bull. With a fence on one side and a steep thorn-clad slope on the other, to 'give him a wide berth' was not an option. An anxious phone call (by satellite!) to Lester Baikie; 'Well, I don't know what to say,' said Lester. 'They won't usually take any notice, but ... there again ... Stay on your horse!'" 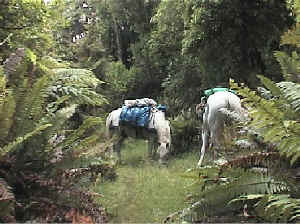 We pushed through the matagouri just above him, trying to keep at least the semblance of a bush between 'his' space and the horses. With remarkable athleticism he was on his feet in a flash. It did not take a degree in animal psychology to recognise the manner he pawed the ground and glared at us as expressing extreme displeasure. The threat turned to nothing - but it took several hours for my adrenalin levels to subside!" Mesopotamia station is the sort of place which is a legend in itself. In a wide and beautiful valley, it is named after the biblical land 'between two rivers' I believe, as it is where the Potts flows into the Rangitata - another wide braided river. I had to wait three days for the river level to drop enough for me to cross it. Malcolm Prouting assured me that it was crossable before this, but I reckoned that what was 'crossable' for him was going to be well out of my comfort zone and I had no wish to accept Laurie's invitation to take a spare plot in the cemetery, which is notorious for being full of people who drowned.... 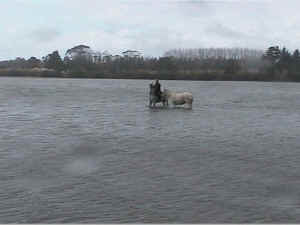 The horses coped brilliantly, swimming as necessary when knocked off their feet by the waves, but nothing prepared me for the river's sheer power. I was jubilant when we got out the other side." Mary emailed The Long Riders' Guild with an update on her progress. Below are some excerpts from her long message. "We finished the South Island at the end of January. That in itself was no small achievement for the horses, and was the end of a very special time for me. We have had some great days - some wonderful riding on the gleaming black sand of deserted beaches, playing with the horses in the waves and some fine views of Mount Taranaki, which has an ethereal quality at odds with the thick dairy pastures surrounding it. From New Plymouth we came up the coast, crossing some big stations and some magnificent beaches. Maori ownership of land can be an issue here - haven't worked out how this works, but it will get more complicated as we go north. Auckland approaches. Not a pretty thought. The idea of the 'real world' which is fast approaching at the end of this ride is hard to take. I try not to think about it. Worst of all is having to think of parting with Foggy. He is just such a star - so honest and so charming. Of course we still have to get there, and there is no certainty yet that we will. The average drivers here seem even more intent than English drivers on killing horses and their riders. I cannot believe that they have such busy lives that the split-second involved in passing wide and slow would make them late for an appointment - least of all in this most laid-back of countries." We spent 2 days near Wellsford, and then went out to Pakiri beach with Felicity and Roger, who I met at Hurunui Horse Treks last year. Borrie was delighted to let Felicity’s horse, Ezra, carry the pack for the day and enjoyed a real hoon on the beach with Roger! The excitement of the moment went to their heads and they indulged in a little getaway exercise that night when we were camped at the forest headquarters – I had visions of horses lost in hundreds of acres of pine forest, but they were in fact laughing behind their sleeves only a few hundred yards away where the grass was greener." "On again in pouring rain through some commercial forest where ‘operations’ were in fact underway – we probably should not have been there at all…." "We crossed the Mangawhai estuary about 2 hours before high tide, so at its deepest it was just above the bottom of the saddle flaps. Had we been ten minutes later however it would have been a swimming job – the tide comes across those flats incredibly quickly." The last month has not been kind in terms of weather and the last three days were into the teeth of an incredibly vicious wind on what is known as 90 mile beach - a surreal experience in itself - and we reached the Cape after lunch on Wednesday in such a strong wind that I did not dare ride the last few yards above the cliff for fear of getting blown off - we walked 'over the line' together. The boys look incredibly well, though we were all a bit shell shocked and weary yesterday. I am so proud of them. Now it is all over I feel fearfully emotional of course - like going into mourning.... The boys have no such worries and are just busy eating."